We’d love your help. Let us know what’s wrong with this preview of Rifles for Watie by Harold Keith. In the Indian country south of Kansas there was dread in the air; and the name, Stand Watie, was on every tongue. A hero to the rebel, a devil to the Un Jeff Bussey walked briskly up the rutted wagon road toward Fort Leavenworth on his way to join the Union volunteers. It was 1861 in Linn County, Kansas, and Jeff was elated at the prospect of fighting for the North at last. He was probably the only soldier in the West to see the Civil War from both sides and live to tell about it. Amid the roar of cannon and the swish of flying grape, Jeff learned what it meant to fight in battle. He learned how it felt never to have enough to eat, to forage for his food or starve. He saw the green fields of Kansas and Okla-homa laid waste by Watie's raiding parties, homes gutted, precious corn deliberately uprooted. He marched endlessly across parched, hot land, through mud and slashing rain, always hungry, always dirty and dog-tired. To ask other readers questions about Rifles for Watie, please sign up. Q. Why didn’t I read this in junior high? Q. Why didn’t my teachers make it mandatory? Q. Why did I ever read anything out of a text book about the civil war? Rifles for Watie taught me more about the civil war than any junior high American History book I ever endured. If I were teaching Junior High history this would be MANDATORY. It was exciting and not biased. The author did a remarkable job of showing the good and bad sides of both the Union and Confederate Armies. The protagonist Jeff Bussey w Q. Why didn’t I read this in junior high? There are few reasons why I wanted to read this book. One, it was highly recommended to me by my sister. Two, is historical fiction (about the civil war). And three, it is based in the mid-west which is mostly ignored during the civil war, except when they mention "Bloody Kansas" for one paragraph in the textbooks. It was a bit long and it took me a while to read but it was well worth it. Hoping to prove himself and defend his home Jeff leaves to enlist as a soldier in the Union Army. He has thi There are few reasons why I wanted to read this book. One, it was highly recommended to me by my sister. Two, is historical fiction (about the civil war). And three, it is based in the mid-west which is mostly ignored during the civil war, except when they mention "Bloody Kansas" for one paragraph in the textbooks. It was a bit long and it took me a while to read but it was well worth it. Hoping to prove himself and defend his home Jeff leaves to enlist as a soldier in the Union Army. He has this idea that going into battle is an adventure. Basically the plot is Jeff finding out what war is really about but still perseveres. Throughout the book Jeff becomes part of the infantry, cavalry, he's a scout and I'd say more but that might gave something away. It's surprising how long and short the book felt at times. I can feel how much work was put into this book. The amount of research must of been tremendous; like details from the terrible confederate coffee to the military jargon. The weather is described, the uniforms, even the terrain. However, I didn't feel it was an overload of detail as some authors do. What really makes the book though is Jeff. Is there a guy like that out there anymore? I kind of doubt it-unless we include the Amish...maybe. He grows up so much during the war, but unlike some other books I've read with war he still tries. Yes, he learns that war is not an adventure and it isn't all it's cracked up to be but he still keeps true to what he knows is right. Jeff does become more somber but not altogether hopeless. As easy as it may be, he isn't extremely bitter though he knows not everyone is fighting for the things he is. Jeff is just so so so...good. I know that a lot of people like the bad boy type but I think good guys are more appealing. Okay, that was cool. :) Might review it further later. Attitudes/Disobedience - 14 Incidents: A boy brings his dog to bed with him after his parents told him not to. A boy won’t tell his father he’s leaving to join the army because he knows his father does not want him to. Another boy won’t tell his mother he’s leaving to join the army because he knows she won’t let him. A boy is teased for his name but he gets back at the person and “felt repaid.” A boy is asked to help steal confiscated watermelons. He doesn’t want to but gives in to peer pressure. A boy doesn’t want to go home during furlough because he’ll “just have another big brawl with Pa” for joining the army. A boy gets homesick so deserts the army. A boy gets into a fight with his mother when she won’t let him return home and makes him join back up with the army. It mentions that a boy didn’t like officers. A boy lies about his age, saying he’s older than he is, so he can stay in the army. A boy shoots himself in the hand so he won’t have to be in the front lines and lies about it. “Never again, he told himself, would he obey an order that took him away from his comrades.” A boy hates his commanding officer because he is arrogant and a bully. A boy is ashamed of his father’s ugliness so never returns to see his father. Religious & Supernatural - 1 Incident: When a boy sees the reality of war, he prays and vows to always go to church if he lives. First, let me say that I get what is good about this book. It's unique. There aren't many decent children's books out there that follow a young soldier around through the entire Civil War, and the ones that do exist are all set in the eastern part of the U.S. I didn't know much about what was going on in the west during the Civil War before I read this book. Most of the scholarship or fiction I've been exposed to has all been focused on the other part of the country. For it's length, it's a very First, let me say that I get what is good about this book. It's unique. There aren't many decent children's books out there that follow a young soldier around through the entire Civil War, and the ones that do exist are all set in the eastern part of the U.S. I didn't know much about what was going on in the west during the Civil War before I read this book. Most of the scholarship or fiction I've been exposed to has all been focused on the other part of the country. For it's length, it's a very readable, usually exciting novel. Part of me wishes it was shorter, but in all honesty, it would have been better served by being longer. It wraps up very abruptly and it feels very rushed. The villain of the novel, Clardy, is killed off-screen, and we are denied a big confrontation. The whole ending just seemed really anti-climatic, but maybe that's the way war really is? You fight and march, and everything's all build up and then suddenly it's all over. I don't know. It didn't make for a great novel ending, though. Now let's play a quick game of Is It Racist? I think there is a definite difference between a racist character and a racist author/omniscient narrator. I'm OK with a racist character existing. There are racist people out there, and of course, they're going to find their way into stories. I have more of a problem when the author or the omniscient narrator is blatantly racist. Let's examine the scenes in Rifles for Watie that made me cringe, and see whether they are reflections of the author's own racism or of they are simply racist characters in a time when the country was very racially charged. The first scene that made me cringe was when Jeff first meets Lucy, his Confederate love interest. She is half-Cherokee, and according to our narrator, very beautiful. Jeff too, finds her beautiful "even though her skin had a brownish cast." My first reaction to that statement was, "What does that even mean?" The answer of course is that Jeff's ideal of a beauty up until that point was a fair-skinned very Caucasian girl. Lucy was so beautiful that it redefined Jeff's definition of beauty. My first inclination is to say that this is simply character racism. After all, it's Jeff's prejudices that we're dealing with here, but after thinking about it, I changed my mind. The narrator says it in such a matter-of-course way. It's like "Of course dark-skinned ladies aren't usually beautiful, but this girl was REALLY beautiful." That nonchalance makes me think that it's really Harold Keith's prejudices that we're dealing with. Then there's the dialect. The African-American slaves that the Union soldiers come across nearly always speak like they do on page 150. "Yassuh! Yassuh! Plenty of hams in theah, suh." The Union soldiers don't really talk with much dialect throughout the book, even though they're all farmers from Kansas. I was ready to give Harold Keith another racist stamp for it, but then we meet the White Confederate soldiers, and they all speak with that dumb, exaggerated dialect, too. So, I really think that, to Harold Keith, Americans from the west spoke in a kind of normal dialect. A few contractions here and there, but usually complete, coherent sentences. The moment you cross the Mason-Dixon line and enter the South, everyone, white and black, speaks in a kind of jumbled up, nonsensical manner. In this case, Harold Keith wasn't racist, only regionalist. If he looked down on anyone for the way he thought they talked, it was the South as a whole. The last scene I want to look at is on page 155. There is a dying slave literally on his death bed. He is holding on to life, so that he can see a Union soldier coming to liberate his people before he dies. Jeff walks into the room, and the man takes a look at his blue uniform, and says, "I bress God." and dies. (Bress. Really?) I call this a white messiah moment. I think that Harold Keith saw his ancestors that served in the civil war as liberators coming in to save the slaves, even though there were men of many races serving on the union side. The whole scene just seemed really condescending to me, and I think the novel would have been better without it. In the end, yeah. I think Harold Keith was a little bit racist.It isn't overwhelming, but I do think he had some prejudices that came out in his novel. Both books have joined the lis A sentimental 4 stars: Rifles for Watie was one of my favorite books when I was young; I don't know how many times I checked it out of the library. Exceptional Civil War story focused on the West and with authentic empathy for a variety of perspectives of the war. Highly recommended for young readers especially. The Audible.com audiobook is breathtakingly well done. One child out of a hundred will love this book above all others. The other 99 won't make it through the first chapter. Although I already knew an awful lot about the Civil War, I learned a little from this book. More importantly, the way the main character was written gave me a new perspective on what I already knew. I was also glad that Keith didn't wimp out on the action, and described it with realism. I think he had me after first mention of lice. This is very well written. In fact, it's proba One child out of a hundred will love this book above all others. The other 99 won't make it through the first chapter. Although I already knew an awful lot about the Civil War, I learned a little from this book. More importantly, the way the main character was written gave me a new perspective on what I already knew. I was also glad that Keith didn't wimp out on the action, and described it with realism. I think he had me after first mention of lice. This is very well written. In fact, it's probably the first Newbery winner that's written professionally enough for an adult audience, and not just well enough for the kids. The most conspicuous aspect of the book is the impeccable research that went into it and the way that historical and geographical details are seamlessly woven in to strengthen the narrative. The book is action-packed, and Keith's characters feel like real people. Any Newbery winner before 1970 requires a diversity inspection. Rifles for Watie holds up remarkably well on this front. Although the first Cherokee character speaks with some stereotypical Tonto grammar, that impression is quickly erased by the variety of carefully drawn Creek, Cherokee, and Choctaw characters. Howard Keith spent considerable time interviewing Cherokees for this book, and it pays off with depictions of realistic people living on many different levels of Cherokee society. In fact, the Tonto grammar is probably based on the speech of someone he interviewed. The portrayal of African Americans is more mixed. Although there are a number of these characters, and they present a variety of personalities and attitudes, they all speak with servile "Yassuh, yassuh," slave jargon. I have no doubt that most Southern blacks spoke this way in the 1800s, and that some still spoke this way when this novel was written. Although Keith makes an effort to describe the slave/master social system, he doesn't do it with nearly the thoroughness that he applies to Cherokee society. The result does not fully explain why African Americans spoke that way in the first place. I also wish that Keith's physical descriptions didn't focus quite so much on rolling, bugged-out eyes. As a side note, the "n" word gets used a few times in ways that I would describe as historically accurate and appropriate to the sophistication of the rest of the book. A reader who understands the rest of the book will understand that this word is a reflection on the character using it, and not on the author's personal vocabulary. He was probably the only soldier in the West to see the Civil War from both sides and live to tell about it. Amid the roar of cannon and the swish of flying grape, Jeff learned what it meant to fight in battle. He learned how it felt never to have enough to eat, to forage for his food or starve. He saw the green fields of Kansas and Okla-homa laid waste by Watie's raiding parties, homes gutted, precious corn deliberately uprooted. He marched endlessly across parched, hot land, through mud and slash-ing rain, always hungry, always dirty and dog-tired. Long but worthwhile, this story has many twists and turns, and although readers certainly know how the war will play out on the large scale, there is a good deal of suspense regarding individual characters. The details of place, characterizations, dialogue, etc. are first rate, making this stand out from more generic juvenile historical fiction set during the Civil War. The author manages to deliver a good deal of history and through interesting juxtapositions of the protagonist is able to conve Long but worthwhile, this story has many twists and turns, and although readers certainly know how the war will play out on the large scale, there is a good deal of suspense regarding individual characters. The details of place, characterizations, dialogue, etc. are first rate, making this stand out from more generic juvenile historical fiction set during the Civil War. The author manages to deliver a good deal of history and through interesting juxtapositions of the protagonist is able to convey the viewpoints of both the Union and Confederate positions. It is clear that there are good and bad people on both sides and also that sometimes extenuating circumstances, not specific choices, are responsible for some predicaments. The fictional elements are handled well and are convincingly presented. We get a nice helping of romance as well. It keeps things interesting, but there is not too much that it distracts from the book's primary intention. The important accounts of battle are described exceptionally well, with both the military actions and the inner thoughts of our hero being brought together to generate an uneasiness and tension that makes the scenes come to life. Anyway, Keith's acceptance speech isn't that interesting. He speaks of his background as sports publicity director for U. of OK as not being helpful, but as writing workshops teaching him the strategies of putting together a successful story. There and in the introduction in the book itself he speaks of all the interviews he did with the aged veterans of the war. So, yes, the details of how the boys dealt with being soldiers, etc., do ring true. In the introduction he admits that the nove Anyway, Keith's acceptance speech isn't that interesting. He speaks of his background as sports publicity director for U. of OK as not being helpful, but as writing workshops teaching him the strategies of putting together a successful story. In the introduction he admits that the novel is entirely fiction, and especially that he knows of no record of Stand Watie, the Cherokee slave owner and leader of rebel Indians, attempting to secure repeating rifles. That's just too much invention for me. I want to know more about Watie, but not from this novel. Read this years ago and recall liking it. This is an exceptionally well written novel. It is the story of a 16-year-old farmer's boy who joins the Union Army after his family survives a brush with Missourian Bushwackers. In preparing for this novel Harold Keith had done an enormous amount of research and even interviewed veterans of the Civil War in the 1940s. In an effortless style he weaves into the narrative a tremendous amount of historical detail. The story is also very realistic in its depictions of the hardships the troops went through from lice to endless marches in the scorching sun, fording freezing rivers in winter, hunger, and cold. Yet Harold Keith never loses sight of his intended audience. The unforgiving nature of war, the carnage on the battlefield, the suffering of the populace are given enough detail to make them realistic but without being overly graphic. Jeff Bussey, the protagonist, is a likable, solid, salt-of-the-earth young man from Kansas. As he adjusts to infantry life he makes his share of mistakes and suffers the consequences. He also has moments of sheer dumb luck, which in the theater of war I am sure every soldier who lives to tell the tale can attest to. Jeff is not a passive participant in all the things that are happening to him. He has an active inner life reflecting upon them. He has a keen sense of right and wrong which he never loses. Harold Keith is a superb story teller. The narrative never slacks, the hardships and action-driven parts are balanced with more pleasant reprieves. All of these serve a purpose, to show in detail that in war there are no winners, at least not with the folks on the ground, in and out of uniform, who bear the brunt of it. Hooray! I'm finally done with this book! Anyhow, it actually did move along nicely and turn into an interesting book about midway through. I'm glad I put it down months ago and picked it up again a few days ago when I was ready to finally read another civil war era book. It's got some issues in it, like the N word. It's not as prejudiced against Native Americans as one would assume from the cover. In fact, it points out that many Cherokees owned large plantations and homes and were actually assi Hooray! I'm finally done with this book! Anyhow, it actually did move along nicely and turn into an interesting book about midway through. I'm glad I put it down months ago and picked it up again a few days ago when I was ready to finally read another civil war era book. It's got some issues in it, like the N word. It's not as prejudiced against Native Americans as one would assume from the cover. In fact, it points out that many Cherokees owned large plantations and homes and were actually assimilated before the events leading up to the "Trail of Tears." Very helpful! My dad was born in the 50's and raised on the stereotype that Native Americans lived in teepees. I finally printed some articles out for him and he couldn't believe it. Anyhow, too bad he didn't read this book as a boy, might have changed his whole perspective. If you are a fanatic about Civil War I recommend this book. If you are guy I recommend this book. It was so well written and really hits on some great parts in our history. 4.5 Stars, but a little closer to 4.49 than 4.51. Jeff is the absolute perfect lead character. The type of small time hero I personally always want to be. Clardy is a genius villain. Book gets 100x better as soon as Lucy Washbourne is introduced. Very good book. This was a really good story, very entertaining, and I will not lie, I enjoyed most of it. But it was very negatively biased against the confederates. Also, there was an over-dramatic, over-descriptive and unnecessary romance. Good Civil War novel! I admit I didn't care for it at first but the story went on and it got better. 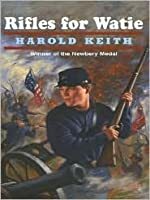 Rifles for Watie starts out with an author’s note that explains the historical research and interviews that Harold Keith conducted in order to make the book as realistic as possible. And that research shows in every area of this book, from the attitudes of the various people to the details of battles to the geographical locations. It’s fascinating to read a book about the Civil War that is remarkably respectful to both sides (mostly the Confederate side). Nowadays, all you tend to get is “Confede Rifles for Watie starts out with an author’s note that explains the historical research and interviews that Harold Keith conducted in order to make the book as realistic as possible. And that research shows in every area of this book, from the attitudes of the various people to the details of battles to the geographical locations. It’s fascinating to read a book about the Civil War that is remarkably respectful to both sides (mostly the Confederate side). Nowadays, all you tend to get is “Confederates bad!” and other, more extreme iterations. Rifles for Watie, however, delves into some of the psychology of, at least, the Native American side of the war (many of whom fought for the Confederates) and has an empathetic, wonderful protagonist in Jeff, who realizes that people are people, not nameless pigs to be slaughtered, and that things are confusing in war when it seems that the side you were fighting against might, actually, have a legitimate reason for fighting you. In this case, keeping one’s property. And no, I’m not talking about slaves. Land and the idea of owning your own property is really the driving force presented in the novel. Jeff is fighting to drive the bushwhackers out and to help his family keep their land without fear of being killed. The Native Americans on both sides are fighting to keep or reobtain their land. While there are slaves, there’s very little mention of slavery as a reason to fight, except when it came to the slave who runs away to join the Union’s all-black regiment. There is, maybe, just a tad too much of the “happy slave” idea, but Keith still treats the subject with respect (and, after all, this was a book for children in the 1950s). Keith also depicts both good and bad sides of both forces. There’s looting from both armies; there’s corrupt Clardy on the Union side juxtaposed with charismatic Watie on the Confederate side; there’s the friendly Confederate cook; there’s the loyal Union friends Jeff makes; and, of course, Lucy, who is on the Confederate side but has respect (and deeper feelings) for Jeff, a Union soldier. Five stars for this Civil War historical fiction winner set in Kansas and Missouri, both states part of the western front of the war. Jefferson Davis Bussey, a Union private (despite his name), enters the war after Missouri Bushwackers torment his family in his beloved Kansas. Jeff’s story is believable, from his ignorance of military vocabulary when he joins the Federals to his falling in love with Lucy Washburne, a Rebel Cherokee young lady, as well as from countless details in between. This r Five stars for this Civil War historical fiction winner set in Kansas and Missouri, both states part of the western front of the war. Jefferson Davis Bussey, a Union private (despite his name), enters the war after Missouri Bushwackers torment his family in his beloved Kansas. Jeff’s story is believable, from his ignorance of military vocabulary when he joins the Federals to his falling in love with Lucy Washburne, a Rebel Cherokee young lady, as well as from countless details in between. This reality comes not only from Harold Keith’s careful research and frequent battlefield visits, but also from memories of Civil War soldiers themselves, from the author’s interviews with aging Civil War veterans as he completed his master’s thesis in the 1920’s. The book is credited with “an authenticity rare” for children’s literature before 1958. Full of memorable characters who grow (or not) throughout the book, “Rifles” shows sympathy and criticism for both the North and the South. We witness moral dilemmas, numbing fear, both deep and glancing pain, and also simple and complex joys through Jeff’s eyes and heart. Noah, Heifer, Lucy, Jimmy, the despicable Captain Clardy, and Stand Watie himself are people from both sides of the war who help Jeff mature nobly as he strives to serve to the best of his ability wherever the tragedy of the Civil War takes him. Jeff makes some decisions foolishly, but the most difficult ones with wisdom and goodness that we wish for those we love. I have read most of the 93 Newberys; "Rifles for Watie" is in my top-ten-most-deserving category. For middle school students and older, it makes both history and human nature shine. This was quite a bit better than I thought it would be. I wasn't enthusiastic about beginning it, but do want to read all or most of the Newberrys. One reason that I enjoyed this book so much is that most of the action takes place at or near where I grew up. And to think that the fantastic schools never mentioned this in 12 years of schooling. Unbelievable. This is a whole new aspect of the Civil War that I was completely unaware of. When I think of the field trips, the real, hands-on "history ha This was quite a bit better than I thought it would be. I wasn't enthusiastic about beginning it, but do want to read all or most of the Newberrys. One reason that I enjoyed this book so much is that most of the action takes place at or near where I grew up. And to think that the fantastic schools never mentioned this in 12 years of schooling. Unbelievable. This is a whole new aspect of the Civil War that I was completely unaware of. When I think of the field trips, the real, hands-on "history happened here" events that we could have received, it just about makes me mad. Ok, I'm over it. This book covers a lot of history and a lot of battles without ever seeming like it's teaching. And the characters are round,and to top it off, our main character, Jefferson Davis Bussey, a 16 year old Kansas boy who joins the Union, actually grows to know that there is more than one side to a story regarding the war. We get a whole lot about the Indians involved in the war, which again, I was totally ignorant of, and understand why they involved themselves in the conflict. This is a different take on a civil war novel. Longer than most novels awarded the John Newberry Medal, it recounts the tale of a young Union soldier named Jefferson Bussey. Jeff is a good character. He goes through many different situations during the war, different from most civil war books I have read. This isn't a long description of all the different battles in the war. It does mention several battles, but is based more on the characters and their stories. The writing style wasn't my favorit This is a different take on a civil war novel. 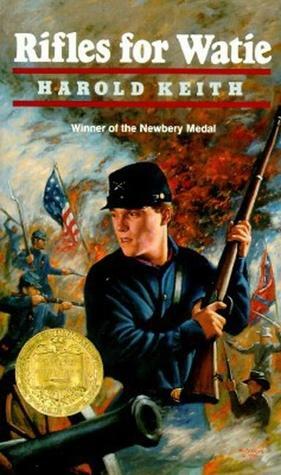 Longer than most novels awarded the John Newberry Medal, it recounts the tale of a young Union soldier named Jefferson Bussey. Jeff is a good character. He goes through many different situations during the war, different from most civil war books I have read. The writing style wasn't my favorite, but it wasn't horrible either. There could have been more dialogue and less description, but that's must my humble opinion. Harold Keith lived his entire life in Oklahoma, a state that he greatly loved and which served as the setting for many of his books. Perhaps his best known story, the historical novel "Rifles for Watie", was first released in 1957. It went on to win the 1958 John Newbery Medal and the 1964 Lewis Carroll Shelf Award. In 1998, Harold Keith died of congestive heart failure, in Norman, Oklahoma.